← Nutella – Is there anything better? This recipe was the cover photo on the magazine Taste of the South about a year ago. (The Feb/Mar 2011 issue) My husband saw it and wanted me to make it. Well, I made it. 11 months later, but at least I made it! It was our Christmas dessert. The devil’s food cake with chocolate buttercream frosting was well received by everyone, even the kids! Preheat oven to 350 degrees F. Spray 3 6-inch cake pans with baking spray with flour such as Baker’s Joy. Line pans with parchment rounds and spray again. Set aside. In a large bowl, beat butter and sugar at high-speed with an electric mixer until creamy, approximately 5 minutes. Add eggs and vanilla beating well. In a small bowl, sift together flour, cocoa, baking soda and salt. Add flour mixture to butter mixture, alternately with buttermilk, beginning and ending with flour. With mixer on lowest speed, add boiling water, being careful not to let water splash out of bowl. Increase mixer speed slowly and mix to combine. Divide batter evenly among prepared pans. Bake until a wooden pick inserted in center comes out clean, 25 to 30 minutes. Let cool in pans for 10 minutes. Remove to wire racks and let cool completely. Remove parchment when cooled. 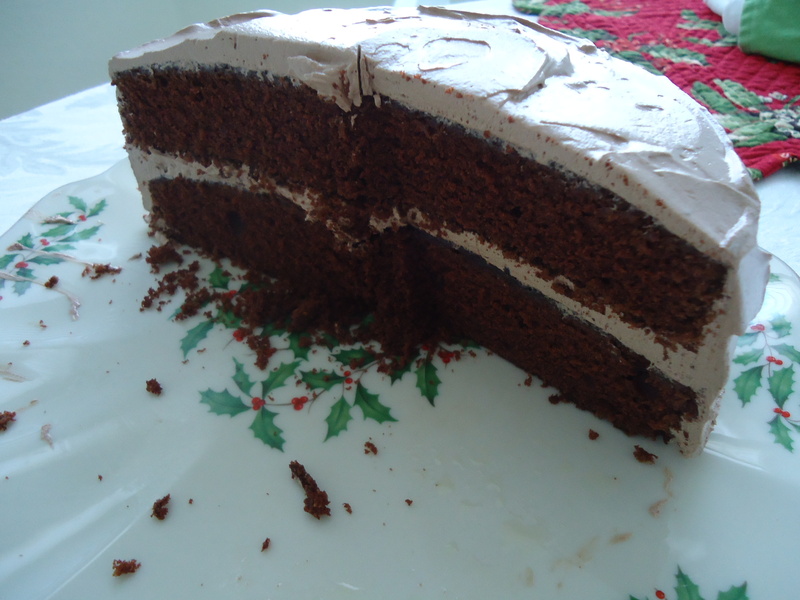 Spread chocolate buttercream between layers and on top and sides of cake. In the top half of a double boiler, combine sugar and egg whites. Cook over medium-high heat, whisking until sugar is dissolved and mixture registers 140 degrees on a candy thermometer, approximately 8 minutes. Transfer egg-white mixture to the bowl of a heavy-duty stand mixer. Beat at high-speed with whisk attachment until stiff peaks form and mixture has cooled, approximately 10 minutes. Reduce mixture speed to medium-low. Add butter, a few tablespoons at a time, beating well after each addition. Add cocoa and vanilla, beating on low-speed until combined. Use immediately. Frosting makes about 4 cups. 1. When it says to beat the butter and sugar for 5 minutes, do it. Set a timer and wait. It will make a difference! 2. If you choose to use 2 8-inch cake pans, as I did, increase the baking time by 8 – 10 minutes. 3. To make the parchment rounds, set pan on parchment, right side up. Trace with a pencil and cut out. 4. If you do not have a double boiler, you can fashion one from a glass mixing bowl set over a pan of water. Make sure the bowl does not touch the water. This entry was posted in All-Occasion Cakes, Company Worthy, Desserts, Entertaining, Special Occasion Cakes and tagged cake, chocolate cake, chocolate dessert. Bookmark the permalink.